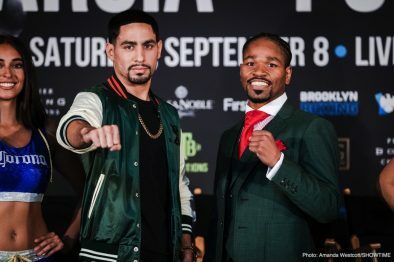 Welterweight stars Danny Garcia and Shawn Porter went face-to-face Thursday at the final press conference before they battle for the vacant WBC Welterweight World Championship this Saturday, September 8 live on SHOWTIME from Barclays Center, the home of BROOKLYN BOXING™ and presented by Premier Boxing Champions. 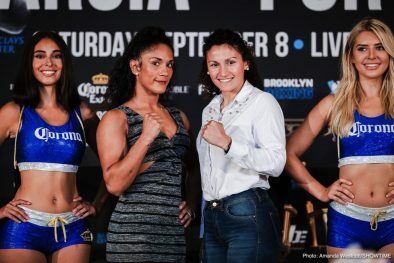 The press conference also featured fighters competing in streaming action on SHOWTIME CHAMPIONSHIP BOXING COUNTDOWN (7 p.m. ET/4 p.m. PT) as five-division world champion Amanda Serrano attempts to win a world title in her record sixth weight class when she faces Yamila Esther Reynoso for the WBO 140-pound title. The social media offering will be available on SHOWTIME Sports YouTube channel and on the SHOWTIME Boxing Facebook Page. “I know I’m the better all-around fighter. 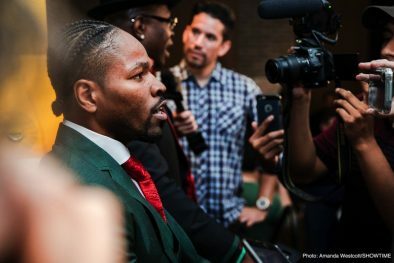 I can just do more in the ring than Shawn Porter, period. I’m going to prove it on Saturday. “It means the world to me to get this belt back. This is a new chapter in my career. I’ve been in a lot of great fights. I’m a seasoned champion. This is a chance to regain something that was mine. This is one of the moments where I have to just go out there and prove myself. 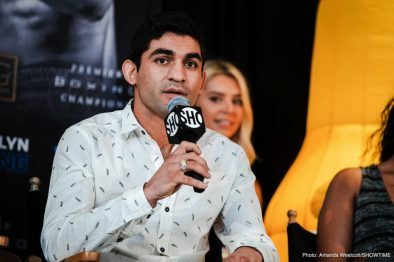 “My style is totally different than Keith Thurman, so I hope Shawn isn’t going off of that fight. I know I’m a better boxer than Shawn Porter and I’m going to make sure everyone else knows it too. 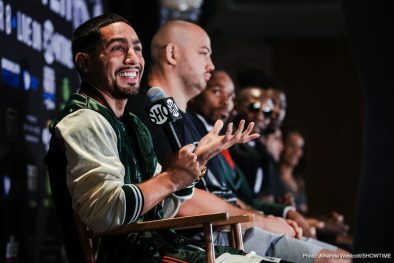 “I absolutely want to unify with Errol Spence Jr. after I win. I want the biggest fights. This would be my fourth world title. All I’ve ever done is face everyone they put in front me and I’ve earned those huge fights. “I’m incredibly motivated, but I know that sometimes in life if you want something too much, you don’t get it. I’ve achieved a lot in this sport. This will just add more hardware to my collection. 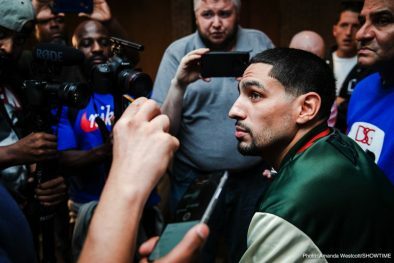 “The way I’m going to win this fight will change the conversation at welterweight. 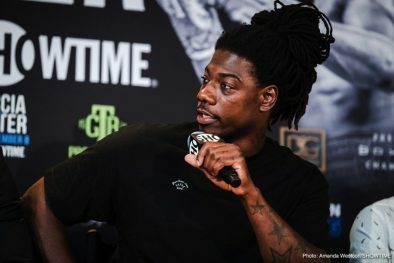 You’re going to have to wonder whether Errol Spence Jr. and Terrence Crawford have what it takes to beat me. I’m here to put on a great show, win this title and do it in spectacular fashion. “I’m used to being the underdog. I’ve upset people before. I’m looking forward to doing what it takes to be that one to pull it off. “Styles make fights. One way or another, I’m ready to do whatever it takes to win this fight. There’s nothing I’ve ever wanted in my entire life more than this. I’m out here to take it. “Anything Danny is coming with, I’m taking it. It’s mine. Whatever it takes, I will not be stopped on Saturday night. “This means the world to me. This is my goal. I’m a goal-oriented person. I didn’t know when I was going to be fighting for this WBC title, I knew this was my time. This title has so much lineage and history to go along with it and I want to be a part of it. 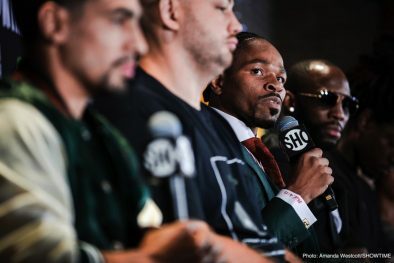 “I’m setting the tone now for what Danny should expect from fight night. He’s had this before, but this is my goal and this world title is mine to take. 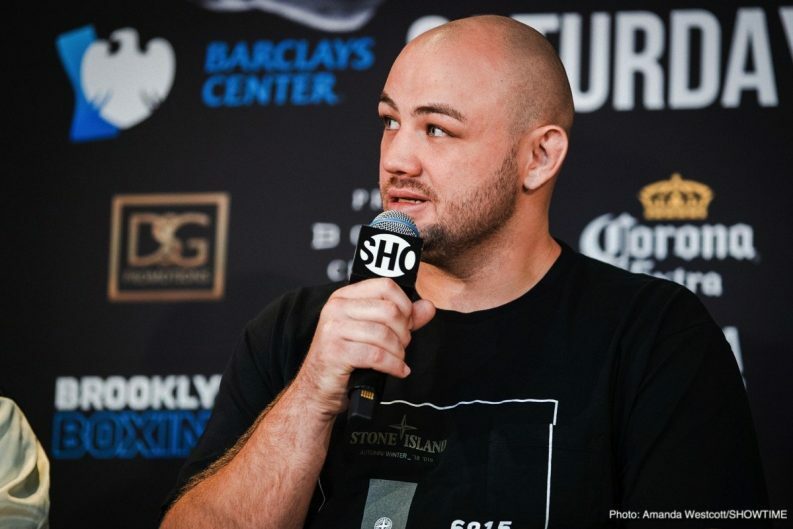 “It’s an honor to be a part of such a big card at Barclays Center. I’m going to do what I need to do. I’m going to put on a great performance, and the rest will take care of itself. “I think I’ve been the most consistent fighter at welterweight for the last two years. If I take care of business on Saturday, a world title shot will be next. “I’m very happy to be in this position. 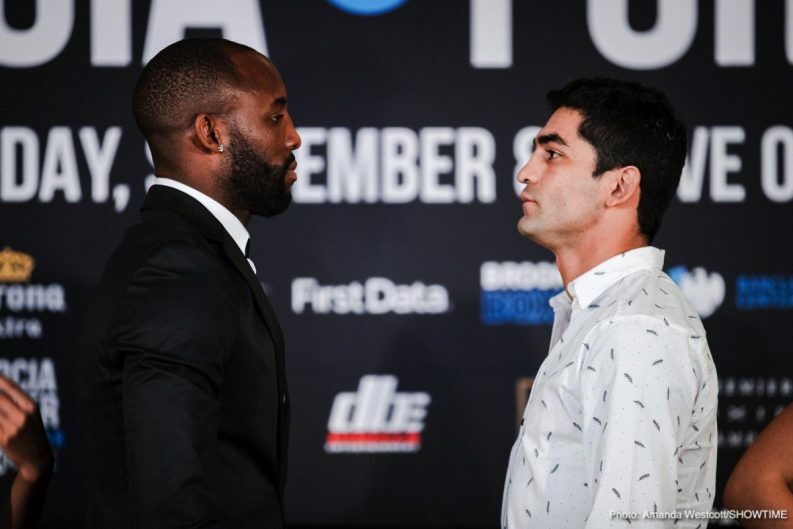 It’s going to be a great fight and it’s going to be my announcement to the U.S. I’m very ready to perform on that stage. “I know that my power and my relentlessness will make this an exciting fight for the fans. I hope that Ugas is not underestimating me, because I want him to be at his very best. “After Saturday night, everybody will know my name. I’m the next great heavyweight here in America. I want to make my splash on the national scene. 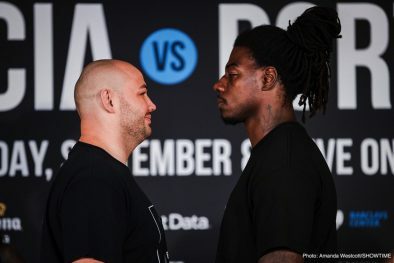 “Last year against Artur Szpilka was an appetizer and this is my main course for really making myself known as a threat to everyone at heavyweight. “I can’t wait to hear the Polish fans and see the red and white. It’s going to be another awesome atmosphere and I’m definitely coming to send those fans home happy. “I’m going to go in there and put on a show. I’m going to get myself back to the position I want to be. That’s at the top of the heavyweight division. “I’m in phenomenal shape. I’ve been working hard for two and a half months. We’re back to where we need to be and you’ll see it on Saturday. “Training in the altitude in California is rough, but it’s great once you get here and feel great. That’s why you work so hard to get in shape, so you can be twice as good on fight night. “I’m so thankful to have this great opportunity to make history again. I’m going to put on a tremendous show like I always do and give my hometown fans something to cheer for. “Come Saturday night, I’m super excited to grab this title in a sixth division. It puts me up there with two of the best fighters of all time in Oscar De La Hoya and Manny Pacquiao. I’ve won all of my titles by knockout and I have to keep that streak going on Saturday night. “This is going to be a sensational show this Saturday night at Barclays Center. This is about as good as it gets. I’ve said that a number of times over recent years, and that’s a good thing. 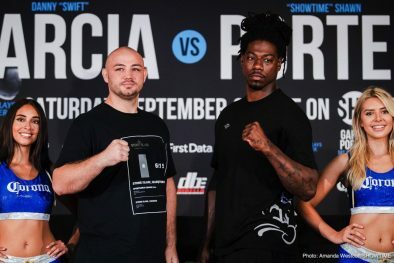 This is another show loaded with talent and has a sensational main event between two of the best fighters in the world, with styles that will mesh really well. “Garcia vs. Porter is a can’t miss fight. 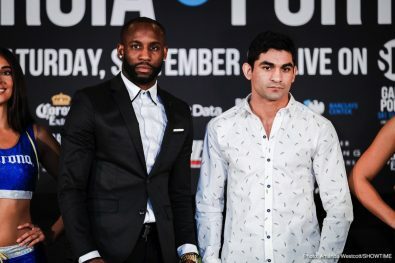 The winner will establish themselves as one of the best in the welterweight division and all of boxing. There will really be no loser, because there’s no way this isn’t an action-packed clash that lifts up both men in the eyes of fans. 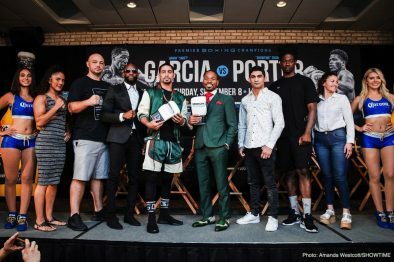 CHRIS DEBLASIO, SVP Sports Communications, Showtime Networks Inc.
“We have established ourselves as an industry leader during an incredible time for boxing. 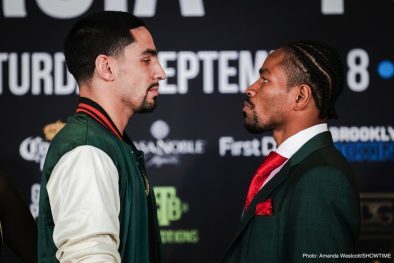 We’ve delivered the largest slate of live boxing, with the best fighters in the most pivotal matchups. Our commitment will continue to be second to none. 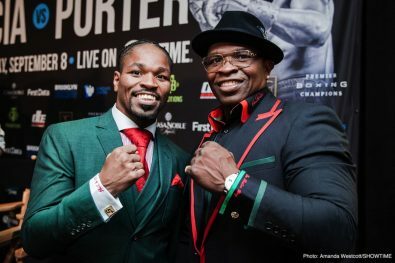 “In 2018, we have delivered 26 live boxing events and 22 world title fights, far more than anyone else. It’s not just the quantity, but the quality. 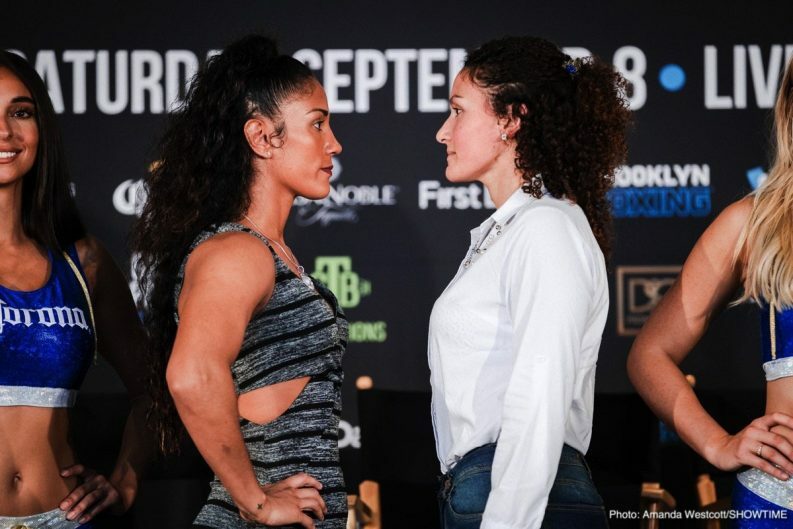 We’ve had several of the best fights of 2018 and have presented three world title unifications and four women’s world title fights so far. “It’s been six years since we’ve been in Brooklyn. We’ve hosted 260 bouts, 46 title fights and on September 8, our 30th big night of BROOKLYN BOXING™. From the start we wanted to make a commitment to the sport and we’ve done that. “Fights like Saturday help us standout from other venues in the marketplace. We have two of the best and brightest stars in the sport Saturday night and we can’t wait for them to enter the ring. 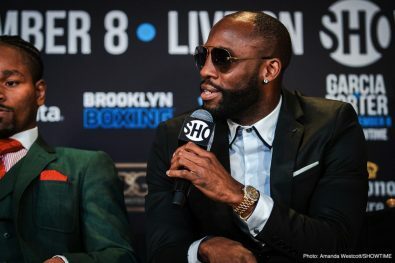 We welcome back those who are returning to our ring such as Amanda Serrano, Adam Kownacki and Charles Martin, and we also welcome Ugas and Barrionuevo, for their first fights in Brooklyn.